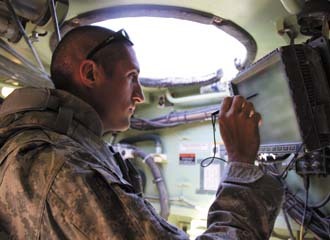 A U.S. Army soldier uses the new Joint Capabilities Release tracking and messaging software, which is an upgrade to the Force XXI Battle Command Brigade and Below (FBCB2) situational awareness system. The Army is speeding upgrades and new enabling technologies to the field to exploit existing networking capabilities. Army technologists are dotting their I’s and crossing their T’s. U.S. Army communicators are focusing on providing key enabling technologies to warfighters who already are exploiting new networking capabilities. The urgencies of warfare, coupled with emerging communications requirements, have mandated that engineers concentrate on the user end of connectivity. This approach can entail providing new handheld mobile media units to individual soldiers, or it can branch out to providing a technology that enables broad coalition-wide interoperability. Just as network architectures are changing with shifts in warfare, so are the activities and systems that deliver information to the humans at the tip of the spear. Brig. Gen. N. Lee S. Price, USA, is the program executive officer for command, control, communications-tactical (PEO C3T). Now based at Aberdeen Proving Ground, Maryland, Gen. Price is in charge of a broad range of communications and electronics technologies that go beyond the traditional purview of C3. She emphasizes that the organization’s primary focus is on deployed forces, and not just those engaged in combat in Southwest Asia. The PEO C3T extends its reach into the field wherever it is deploying new technologies or supporting upgrades. “For the products we provide—from the operational side, from the safety side and from the security side—we are there with them every step of the way,” Gen. Price says of PEO C3T support to the warfighter. The past 10 years have seen a surge in new networking capabilities to Army forces in the field. Concurrent with this are new applications and warfighter requirements generated by nearly a decade of conflict in two different arenas. As a result, the Army now is tasked with providing the tools to exploit this new networking to its fullest. “While we spend a large part of our time talking about the transport layer, it’s really what that application at the end does for the deployed warfighter that is the important aspect,” Gen. Price declares. The general explains that the PEO C3T is driven by operational needs statements (ONS), particularly those that are joint and urgent (JUONS). In some cases, the PEO C3T already can support an ONS; in other cases, it requires some developmental work. The focus tends to be on the combatant commanders, she explains. Gen. Price cites the development of the Combined Enterprise Regional Information Exchange System (CENTRIXS) International Security Assistance Force (ISAF) capability as an example of a major PEO C3T effort. The guidance for this effort came from the highest levels: President Barack Obama wanted other countries in the ISAF to be full partners in the coalition. In any tactical operations center, the fight centered around the secret Internet protocol router network (SIPRNET), which carried information at the U.S. Secret level. Countries’ information would be exchanged personally by liaison officers. The development of the Afghan Mission Network (SIGNAL Magazine, January) allowed other countries to connect at the coalition-releasable level. The PEO C3T developed CENTRIXS ISAF to be the U.S. contribution to that network. Gen. Price notes that PEO C3T engineers saved more than $10 million by repurposing much of the equipment, and they also released the bulk of the applications to enable interoperability. The general relates that her organization is busy supporting U.S. Forces-Korea (USFK) as it undergoes significant relocation. U.S. Army-Africa also is working with the PEO C3T on a command post on-the-move. An older canceled program, known as maneuver battle command on-the-move, has laid the groundwork for the organization’s efforts for those two overseas groups. And, USFK also is looking to exploit CENTRIXS. With mainstreaming new technologies at the core of PEO C3T activities, the organization was involved heavily in the Army Network Integration Evaluation (NIE) held in the southwest United States during six weeks in June and July. Hosted by the Army’s Brigade Modernization Command, the Army Test and Evaluation Command and the Program Executive Office Integration, the NIE offered the opportunity for the PEO C3T to perform record tests of various new and ongoing systems in a single operational venue. The PEO C3T helped build the network architecture for the NIE. It comprised two dozen terrestrial satellite systems and more than 100 vehicle-mounted networking radios, as well as radios attached to unmanned aerial vehicles and a commercial 3G network for smartphones. As defined by its name, the NIE focused on determining whether these new and diverse capabilities could operate together seamlessly. The NIE also tested several ongoing PEO C3T projects. These include the Joint Capabilities Release, which is an upgrade to the Army’s Force XXI Battle Command Brigade and Below (FBCB2); the Joint Tactical Radio System (JTRS) Handheld, Manpack, Small Form Fit (HMS); the network integration kit from the C3T; and the Ground Mobile Radio. The evaluations featured tests of this gear in an Army architecture comprising equipment that has been fielded. Industry partners also contributed systems to be evaluated for capability and cost. Among the PEO C3T’s major efforts is the Warfighter Information Network-Tactical, or WIN-T. Increment 2 of the program attained its Milestone C low-rate initial production in February, and efforts now focus on building toward the initial operational test and evaluation in April 2012. Increment 2 provides initial on-the-move capability and a mobile infrastructure that embeds communications gear in commanders’ vehicles. It offers voice, data and real-time video in extending the network down to the company level. Some WIN-T Increment 2 equipment already is on hand, Gen. Price allows, and some of that gear is headed to Fort Bliss for familiarization evaluation of various aspects. She expresses confidence that WIN-T will meet its 2012 deadline. The only potential drawback might be ensuring that it will be available in sufficient quantities, she offers. All of these systems must have adequate security, and communications security (COMSEC) is one of the PEO C3T’s newest areas of responsibility. Previously, COMSEC had been purchased in an ad hoc manner without much lifecycle program management. Last September, the PEO C3T became the product director, Gen. Price relates. Her goal is to provide COMSEC in a cost-effective manner, working with the National Security Agency and providing centralized management. She has established an office staffed with experts to whom people would come with COMSEC questions. “If you’re in the Army, ordinarily your focus is just on the Army,” Gen. Price offers. “But in the COMSEC arena, you have to be able to stretch into the joint arena as well.” So the PEO C3T COMSEC operation is establishing communications lines across a broad area. Among the biggest challenges to achieving effective COMSEC is to assemble all of the different parts, she continues. This entails determining just what is out in the field, where it resides, how it is accounted for, and who is in charge of the lifecycle management. These different components must be accounted for, and a management structure that includes all of the different required stakeholders must be installed. That process has been underway and is going well, she adds. A Warfighter Information Network-Tactical (WIN-T) battle command post node links forces participating in the Army Network Integration Evaluation (NIE) held in the southwest United States in June and July. A key upgrade to WIN-T, Increment 2, is slated to be fielded next year. Even alternative energy comes into play. The Project Manager Mobile Electric Power (PM MEP) at Fort Belvoir, Virginia, is advancing new electric power systems for troops in the field. Gen. Price notes that many forces are living in forward operating bases in Iraq and Afghanistan instead of in tents. These aggregated units are ready for power systems that serve their configurations. The general notes that PM MEP is working closely with the Office of the Secretary of Defense on new operational energy strategies. One project, known as microgrid, is on the verge of deployment to Afghanistan. This effort would employ smart generators to reduce the fossil fuel footprint on the battlefield. This innovation links the generators so they can offload current to one another and back up each other during peak power needs. The goal is to replace existing generators with power systems that are 21 percent more fuel efficient and cost only 82 percent of the existing units, she adds. One of the big challenges facing the PEO C3T involved its Base Realignment and Closure (BRAC) move from Fort Monmouth, New Jersey, to Aberdeen Proving Ground, Maryland (see box, below). The general relates that approximately 1,500 spaces will move by the middle of next month, and that move could not be allowed to interrupt the organization’s support to the warfighter. She adds that not enough attention was paid to the move’s effects on the civilian work force. The workers who made the move had to reestablish their social support infrastructure in a new small community. New hires were necessary, and the new work force required training and certification. The organization had to shift its training support from the Defense Acquisition University to the new location. Attrition was a problem, particularly with loss of expertise; but the organization was able to reorganize the work force to meet modern needs. Gen. Price lauds the facilities at the new Aberdeen location. Her organization’s building has 1 million square feet of space, and laboratory facilities now are centralized and state-of-the-art. Many government partners and industry contractors are co-located with their PEO C3T counterparts. A technology developed to help a U.S. Army organization survive a Base Realignment and Closure (BRAC) move has found life as a Defense Department-wide dot.mil domain serving the entire defense community. The original concept has grown to become a vital information-sharing endeavor with functions that far exceed its original reach. Known as milSuite, the system is run by the Army’s Program Executive Office, Command, Control, Communications-Tactical (PEO C3T). Emerson Keslar, chief information officer and director of MilTech Solutions at PEO C3T, relates that milSuite was developed as a result of the BRAC move from Fort Monmouth, New Jersey, to Aberdeen Proving Ground, Maryland. The Army’s Communications-Electronics Research, Development and Engineering Center (CERDEC) was concerned about the loss of scientific and engineering expertise in that move, so it set up the site to save institutional knowledge. The goal was to amass as much institutional wisdom as possible before many experienced workers who did not want to follow CERDEC in the BRAC move left the organization. However, that original goal proved to be more useful than just as a knowledge repository. As its activity increased, the site became a means for all members to exchange vital information. As is typical of many Web 2.0 applications, milSuite built a large community that began to discover new capabilities. It became more than just a place for departing experts to warehouse their accrued knowledge. MilSuite now serves more than 140,000 users throughout the Defense Department for activities ranging from education and training to program networking. He explains that milSuite is a collection of Web 2.0 online tools that correspond to commercial social media. It comprises four major products: milWiki, milBook, milBlog and milTube. MilWiki consists of encyclopedic information; milBook is a networking tool, similar to Facebook, for communities of practice; milBlog allows conventional blog information sharing; and milTube is for video sharing. The expansion of milSuite capabilities parallels that of commercial Web 2.0 activities, he notes. Its users are experienced in social media, so milSuite’s development has been grass-root driven. His office has not had to undertake a major effort to train users or encourage adoption. While early adopters help increase milSuite’s popularity and capabilities, the tools are attractive because of their commercial ubiquity, Keslar adds. As milSuite expanded beyond its original boundaries, increasing awareness and promoting its capabilities became a big challenge, Keslar notes. His office has undertaken several measures to increase participation. Currently, milSuite gains roughly 1,000 new users every fortnight. However, he points out that this figure still represents only a fraction of the potential users throughout the entire Defense Department. Reaching the many diverse organizations inherent in the different services remains a challenge. Also, many people have not yet realized how these capabilities can help them do their jobs better, Keslar suggests. So, the PEO C3T is developing use cases for templating capabilities for new user organizations. This makes adoption easier for many who may be hesitant, he adds. The Army Training and Doctrine Command (TRADOC) is exploiting milWiki to promote online collaboration of Army field manuals. Keslar describes this as a complete change in the way that TRADOC does its field manuals and its Army tactics, techniques and procedures (ATTPs). The Army contracting community is using it to list service contracts to help eliminate redundant contracts and increase awareness. One Army senior leadership project, known as Orion, will change the means of communication with top generals. Even the Army chaplain community has a community of interest in milBook. These success stories are just the beginning, Keslar adds. For the future, the PEO C3T will be working to implement some back-end technologies to integrate instant messaging and chat, Keslar reports. Search and discovery tools are on the menu, and he believes his organization has a good solution for that challenge. Designers also will be focusing on using milSuite in a mobile format. “This is a game-changer,” he declares. “This is going to change the Defense Department. I’ve seen how it’s being used by its users, and it is making significant changes in how they operate.